Former Chairman of the Board and good friend of The Peregrine Fund, Donald James Nelson, died from the effects of a stem cell transplant on 11 March 2010. A resident of Boise, Idaho, Jim had been diagnosed previously with MDS, Myelodysplastic syndrome. Jim joined The Peregrine Fund Board of Directors in 1993 and served as chairman and secretary. He was a strong supporter of the World Center for Birds of Prey, contributing time, equipment, and resources to numerous landscaping and construction projects. He helped pave the road to our hilltop campus, which made it possible to open our doors to the public. Exceptional people skills made him an extraordinary advocate for the organization in the community. The Christmas parties he hosted each year were eagerly anticipated by the staff and their family and friends. For 30 years, Jim was president of Nelson Construction. Known for his vitality, intellectual curiosity, and zest for life, Jim included the environment among his many passions. An avid traveler, Jim visited and participated in Peregrine Fund projects in Greenland, Guatemala, Panama, and Hawaii. He surveyed migrating Peregrines in Texas for research projects and was part of a board trip to Ecuador and the Galapagos Islands. Jim is survived by his wife, Karin, also a good friend and contributor, and their two children and four grandchildren. 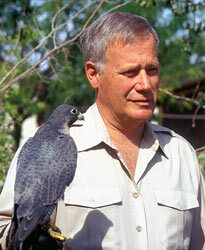 A memorial service to honor Jim’s life was held at the World Center for Birds of Prey on March 22.